The shiny, sunny blooms of buttercups are starting to show up–a sure sign that spring is coming. California buttercup (Ranunculus californicus) is a common sight in much of California. Look for the bright flowers with many petals (between 7 and 22 of them) atop slim, straight stems with deeply divided leaves. Buttercups were one of my favorite flowers as a kid, mostly because of a silly game my parents would play. If a buttercup placed beneath your chin made your skin looked yellow, then you liked butter. I loved butter, and thought the game was great fun–though now it seems that was the point, since the trick would work on everyone. It turns out that this game goes back a long ways, as it is listed as a traditional use of the plant by the Kashaya, Pomo and other native tribes in this part of the world. Indigenous people made bread and porridge from a flour of dried, pounded seeds of California buttercup. This flower can grow in low moist fields and streambanks, in forest understory, and on shrub-covered hillsides. It likes meadows and wetlands, and is equally likely to grow in wetlands and non-wetlands. 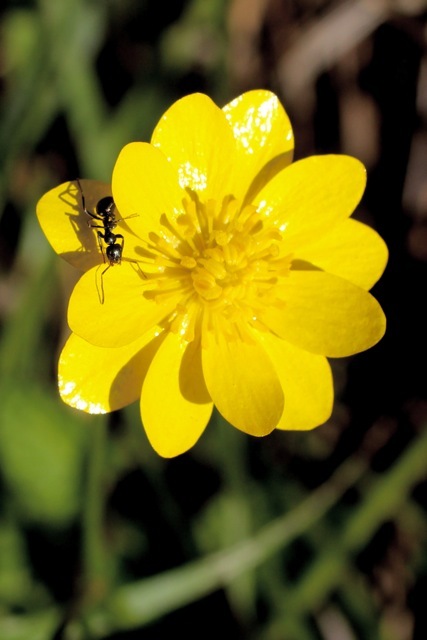 Unlike some types of buttercup, this one is happily lacking in stickery, spine-covered seeds.